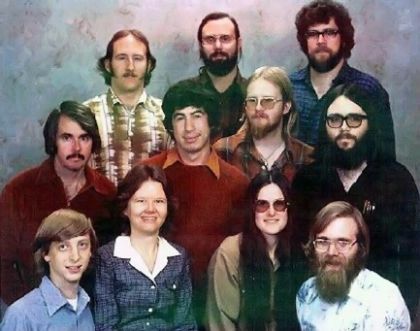 That is a photo taken on December 7th, 1978 and it represents the Microsoft staff. In case you’re wondering, Bill Gates is located in the lower left corner of the picture. The rest of them are as it follows, left to right. Top row: Steve Wood, Bob Wallace, Jim Lane. Middle row: Bob O’Rear, Bob Greenberg, Marc McDonald, Gordon Letwin. Bottom row: Bill Gates, Andrea Lewis, Marla Wood, Paul Allen. Who would have thought those geek-ish people would help Microsoft become the great corporation it is today?